DEF team member Chhaya Dabas pens her thought on the increasing cases on trolling in India and around the world. Social media has seen a surge of sociality in recent times. When social platforms emerged – with a noble pursuit to make communicating as an act more accessible, democratic and personal – barely had anyone anticipated their growth to be so raid and intrusive. Social media today has become a giant. It has grown into narratives of individuality and expression, but also unfortunately, has become a forefront for unsolicited violence and abuse. When social platforms came into formation, nobody knew where social media as a practice or discourse was headed; frankly nobody can map its trajectory even today. Everyday a new discussion ensues, a new battle erupts, and the proponents argue with the antagonists – is social media slowly, unapologetically harming us or are we slowly, carefully learning how to adapt to these new locomotives of language and expression? And can we steer the social media discourse towards a more positive, secure and inclusive one? As far is this article is concerned, social media is here to stay. It is becoming more and more engrained in our daily routines and habitual activities. One can mark this shift if one thinks about the point in time, when Facebook or Instagram became verbs, or to-do acts and ceased from being mere nouns. From a morning barrage of WhatsApp messages to your afternoon cup of Instagram, your Facebook browsing to your nighttime story of how another meme disrupted the calm and sent you into a fit of laughter or a thought-provoking political analysis; social media cannot become more social. So, the real question is what to do about this highly intrusive, social extrovert, who while challenging its own nomenclature has made us more antisocial but also antiseptic to a lot of garbage that the Internet has to offer. This discussion begins from that point. 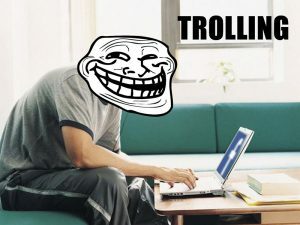 This discussion is about trolling. So in short, we have been reduced to bait. Recent cases of trolling, may it be Sushma Swaraj, Gurmehar Kaur, Rana Ayyub or the many unspoken cases of online abuse that go unseen and unheard of; suggest, beg us indeed to consider this more than a passing fad or a receding wave of unscripted and unruly fandom, but a serious worry with a persistent urgency. This discussion insists us to care, consider and challenge this mainstream habitual routine to react and engage, without a second of consideration or a thoughtful reconsideration. This insistence on consideration emerges from two separate tangents of the same dialogue that we touched upon earlier. First tangent focuses on the evolution of the ‘prosumer’. The term, unfamiliar in many circles and discussions, refers to the hybrid online participant – a combination of a consumer and producer of content. As prosumers, we are all participants of n: n production of information, having moved beyond the 1: n production of content. The latter is characteristic of traditional media such as radios, newspapers, television. To elaborate, the difference lies in the direction of information. For example, when content is produced via a newspaper, a consumer must wait an entire day to access the information and is only able to respond via channels such as letter to the editor. But in contrast, in the age of new or digital media, the response to any information is immediate, urgent and carries an impact. Further, in the digital discourse, the focal point always has been the quick access to information. This could be about celebrities; political stand-off; public disputes; events and happenings and any other topic of conversation that is public in nature. In the digital world, the boundaries blur between the personal and public spheres. One rarely hesitates in proliferating information of any nature, either for seeking fame or being attributed as the source of a viral thread. The same contribution or attribution to virality creates a space and threat for fake news, trolling or other ailments of the online world. The quick bait culture that has taken roots is creating a tension and is begging us to address the context and the onus of responsibility. But who is to be blamed? When Gauri Lankesh, the celebrated journalist was shot dead outside her residence in Bengaluru, the question of implicit verses explicit threat came to light. It made many journalists ponder over the rising threat in the online sphere. Unfortunately, the legal apparatus addresses explicit threats only. But the question arises; can it get more explicit than Gauri Lankesh? Where do the companies like Facebook or Twitter come in? What is the complaint registering mechanism beyond the available reporting tools? These are often the spaces where online hate takes form of explicit content such as graphic images, name calling or threats. Is the mechanism to file a complaint against a harasser easy and are the laws strong enough to prevent them from further sharing disturbing content from another account? It is also necessary to understand where an encrypted software like WhatsApp interferes, is encryption creating a more secure or vulnerable environment? The second concern is how can usage be rectified? Usage refers to consumption and circulation of information. The rapidness renders technology both a boon and a bane. It has ensured, for example, relief reaches victims during catastrophic events such as floods in Kerala, where people communicated through social media to contribute to collection drives. It has also given room to #TimesUp or #MeToo campaigns; without the proliferation via social media such movements wouldn’t have found a global reverberation. They took birth on social media platforms. There are innumerable examples like such that suggest a highly hopeful and positive outlook towards social media. On the other hand, technology has also provided protection to identities that pose threats such as instigating violence. But till when and how many fingers do you point? One must understand that use of online platforms is largely personal. Geo tags, personal details can be misused or mistreated. The question one must ask oneself is, how social do you want to be and how necessary is it to contribute to our sociality? Maybe one needs to carefully redefine their personal and public spheres and demarcate the roles they play in both spheres. For a woman and a witness and victim to online trolling, trolling, too, takes a gendered route. It is sad but true, that abuse catering to women is often of a sexual nature. While men get trolled too, those targeting men seldom attack looks, age, or sexual parts. It doesn’t come as a surprise that over 74 per cent of Facebook users are male. So, it makes one wonder, are the patriarchal stalwarts and proponents of male entitlement finding shelter or respite online? This discussion honestly is endless because social media, as an industry or discourse or research, is still growing and evolving. It is too soon to jump to conclusions. It is a process still gaining momentum and we can only address and understand it in parts, which is exactly how we should focus on it. Considering social media is driven by context and context varies and adapts, solutions that might cater to the Indian community may not be applicable to western countries and vice versa. You can only repair it in parts. Secondly, the conversation on and of social media doesn’t stop here, neither is it limited to this conversation. But this could be a start and a reason for one to stop and reflect on how and why one uses social media and whether one wants to rework that relationship. Hopefully, considering social media is here to stay and its use is becoming more ubiquitous, we can steer it towards community empowerment and mobilisation more, and reduce threats that have become part and parcel of social platforms such as trolling.